Every weekend I make pancakes. I make them on Saturdays or Sundays, depending on what our schedule looks like for the day. It doesn’t matter if I don’t have syrup or I am too sleepy to measure correctly. 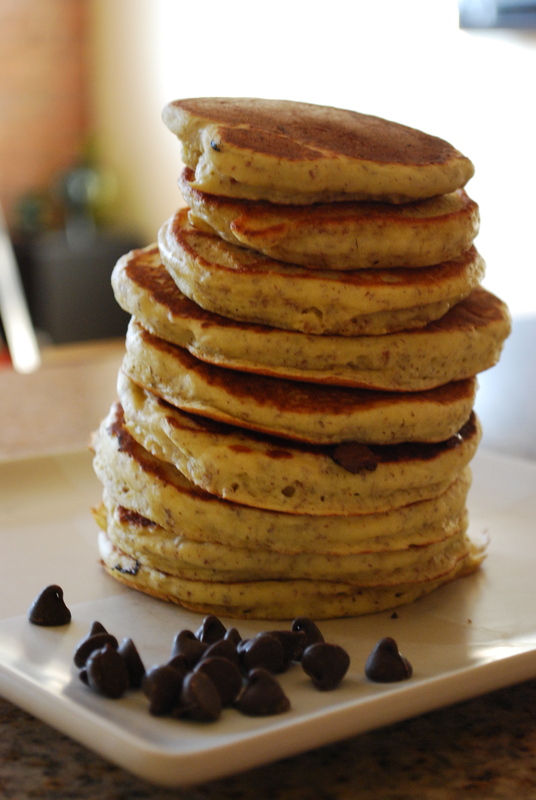 If it is the weekend, and you are in my house, pancakes will be served. This is our tradition. As the holidays are approaching- I know we are in October, but they really are fast approaching -I have been thinking a lot about family traditions. Not the ones passed-on generation to generation, but the little ones that make our nuclear families different and special from the rest of the family. Small traditions make families our own. The other traditions, the big ones we share with our extended families are great, but there is something special about sharing traditions with those you live with. They are often quirky or silly, or both; at some point, I am sure we’ve all been embarrassed by some of them, but they make us who we are. My sister and I not-so-patiently waited for my dad to take a shower before we could go to the living room on Christmas Day to see what Santa had left under the tree. We giggled, called for my dad to hurry and could not contain our excitement. In the mean time my mom would put together a small breakfast to enjoy while opening presents. I often wish I could do this one more time; It was so simple and so fun. It was us. My husband and I started our first tradition one Thanksgiving. I wanted to make pumpkin pie, like my mom had made every Thanksgiving, but as I learned that year, he does not like pumpkin pie. I was devastated. I thought my mom’s pumpkin pie, would be something I could bring to our budding family, we were to be married the following year. Maybe, he suggested, we could make our own tradition for Thanksgiving. I was skeptical at first. Thanksgiving doesn’t vary much from tradition; turkey, mashed potatoes, sweet potato something, pumpkin etc. is on pretty much everyone’s table on the fourth thursday of November. I went along with him, anyway, and we looked for a dessert we both absolutely loved and did not get to eat often. We decided to make Tiramisu. We both know that Tiramisu has nothing to do with Thanksgiving, and over the years- it’s going on 7 now- we’ve had our share of weird looks and some complaints when we’ve brought our Traditional Thanksgiving Tiramisu over to family and friends’ gatherings. But every year, as I am soaking ladyfingers in coffee, I smile realizing that this is one tradition we can really call our own. The pancakes on weekends are not as different, I am sure many families have pancakes on weekends too, but as the years have passed, and the stacks have been eaten by us and now our son, I realize that this is how we are making a family rich with tradition, one bite at a time. Our pancakes are not always the awesome, fluffy rounds they should be, and many weekends I don’t even have maple syrup to pour over them; but they are not difficult to make, everybody loves them, and I get to try different recipes, fillings, toppings and mixes. As I am perfecting our weekend pancakes, I am adding to what makes our family our own. I hope to make many more pancakes. When I look back at my life, I hope I see weekend mornings filled with conversation, laughter and the smell of pancakes on the griddle. What are your nuclear family traditions? As a former roommate I can attest to the pleasure of having pancakes with Olivia! I recently made two different variations and enjoyed every minute as I plotted what fillings or substitutions would go best–it brought back Boston memories for sure.